A 3D printer transforms digital files into three-dimensional solid forms using materials such as steel and aluminum or plastic filaments. 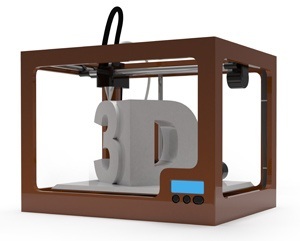 3D printers are marvels of technology, generating a solid model from a CAD drawing in a few hours – meaning a prototype of any design may be readied for a client meeting in a relatively short time. They are also available in kit form for commercial or home office/studio use, with prices under £1,000 plus VAT. The fact that such advanced technology is now affordable for both commercial and personal use demonstrates how rapidly it has advanced. Three-dimensional printers produce objects by building layers; they are so accurate that even the most complex design can be rendered in three-dimensional form. Materials are often "powered" metals such as steel or aluminum. Plastics are also used to create models in the form of coloured or translucent plastic filaments, which become molten in the printer and are molded into an accurate solid representation of the CAD design. Some models can only handle one or a few spools of filament at a time, but manufacturers like Objét Connex make models capable of using 14 spools of filament to produce highly complex coloured objects. 3D printers are used for a broad variety of applications, from food production (pasta shapes) to medical labs (artificial body parts). Self-assembly kits are available starting at less than £1,000 plus VAT; these are great for school science projects as well as commercial and home studio art work. Engineers – for hinges, connectors, tubing, etc. Toymakers – to make small or larger toys and components like building bricks.